Give a kiss goodbye to power sockets and embrace the power of the sun. The RAVPower RP-PC005 is a solar powered portable charger that utilizes the sun’s rays to charge your smartphones and tablets. Constructed with our premium SUNPOWER solar charging cells that have an increased charging efficiency of 21.5% – 23.5%, you can power your portable devices from sunrise to sundown whenever you are outside. Chunky and cumbersome solar chargers are a hassle to carry, set up, and use. For something much easier, this 26.4 oz (754g) solar charger is half the size of similar chargers yet capable of generating just as much energy without the extra baggage. iSmart technology automatically detects and delivers the optimal charging current for any connected device, ensuring the fastest and most efficient charge. 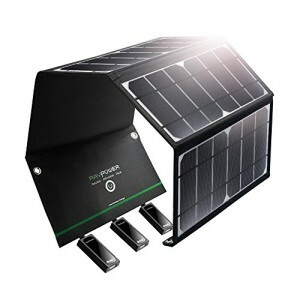 When under direct sunlight, all three ports are individually capable of reaching 2.4A; with a total of 4.8A being reached when all three devices are simultaneously charging. Having an option for more than one USB port can result in an uneven distribution of power where one device charges faster than the other. With our built-in Smart IC chip, the flow of energy is regulated resulting in every device charging at an even and constant rate. Whether you’re placing it on the ground, stretching it across a tree, or hanging it off your backpack via the four stainless steel hooks, as long as it’s directly under the sun, your devices will charge. When outside and the elements suddenly turn on you, the waterproof nylon covering protects the solar panels while the pouch ensures your devices stay dry.